These anti-static cleaning wipes are lightly moistened for maximum control over dust and smudges. 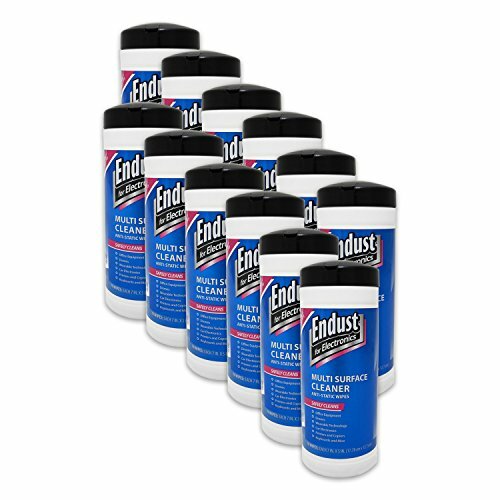 For advanced streak removal please pair with Endust for Electronics Microfiber Towels, sold separately! This pack includes 70 wipes per canister, and is especially formulated to safely clean electronic devices. Just one wipe is perfect for any smaller electronic surface you are looking to clean. Perfect for fragile tablet equipment, remotes, controllers, towers, console, gamer devices, radios, and backs of televisions TV are great for these wipes. If cleaning one small handheld device such as a remote, you may need to remove excess moisture to avoid streaks. Please read packaging for more information. Larger surfaces such as full VR equipment are great, but require extra wipes depending on the size and debris. People who wear foundation or powder love that it removes the debris and skin oil smudges on their portable devices. These are great surface cleaning wipes. The debris cling to the fabric on the wipe, rather than leave excess debris once your device dries. There is no pilling from the actual wipes. Pair with our screen cleaning wipes, and our microfiber towels for amazing results.